If you are looking for an intelligent obstacle-avoidance drone that has an included 4K camera, then you should take a look at this model. The YUNEEC Typhoon H480 is a versatile hexacopter that comes with a lot of great features necessary for the professional UAV flight. 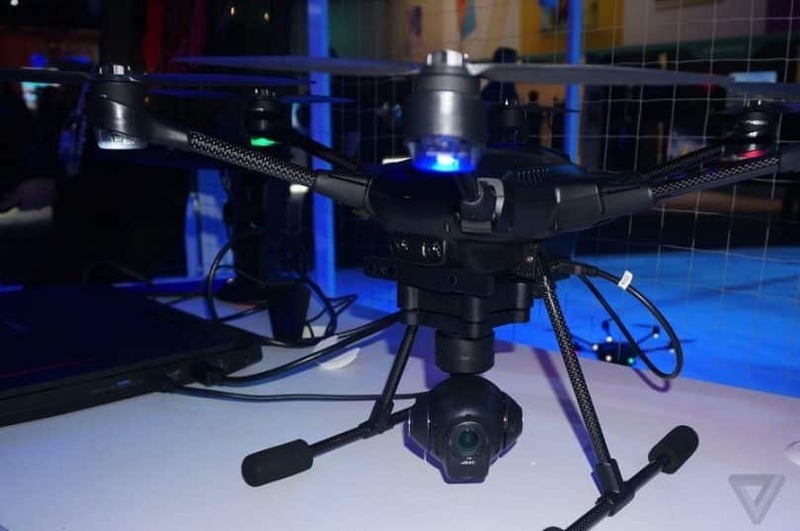 Besides the advanced functions, it is equipped with a 360-degree rotation camera, so you will be able to take the 12 MP photos and shoot 4K HD videos while flying it. And, that’s not all about this amazing drone! 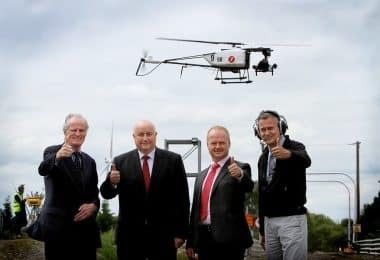 The YUNEEC company has become famous in the past few years due to their amazing electric aircrafts. 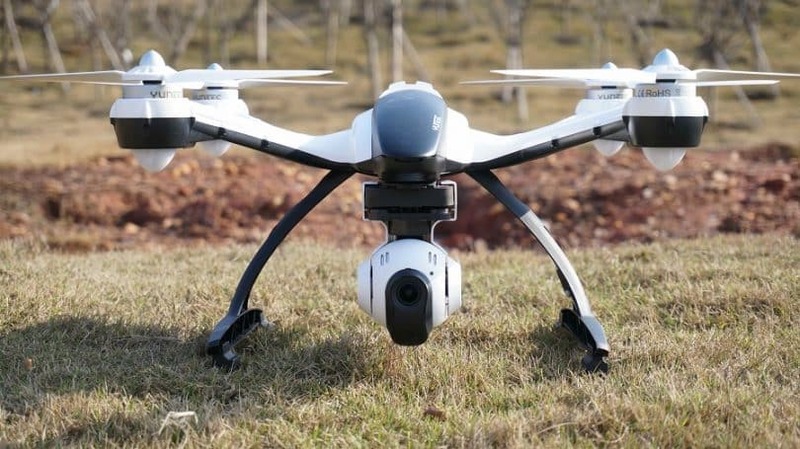 In 2017, this company launched the “Typhoon” series of professional commercial UAVs, and among these models, Typhoon H480 is surely one of the most popular drones these days. Be aware: This model is intended for professional drone pilots with flight experience, so if you are a novice in this field, this hexacopter is likely to be a bit complicated to you. As for the return policy, if the product is damaged or not as described, sellers usually allow you to return it and receive your money back. Also, pay attention that the guarantee period is not mentioned on sellers like Amazon, so you will have to contact the producer directly in case something goes wrong. Regarding the price, the device is quite expensive, but the price reflects the high-quality standards and the level of performance this device is capable of implementing. Besides this, it features a modern and compact design with a retractable landing frame. The body is mostly designed with carbon fiber which reduces the weight significantly and increases the durability of this device. In the end, after analyzing all the benefits, you will definitely understand why the H480 is so pricey. Another advice to bear in mind: When using this drone for the very first time, you should carefully check whether all the components are included in the package. Also, you will have to adjust it before the first takeoff, which means to install the propellers, connect the ST16 ground station, put the batteries, and the like. Want to find out more about this copter? Below, you can find everything about this model – its main features and specs, comparison with the similar models on the market, pros & cons, and much more. In general, this is a quite sturdy aircraft but, it is not the sturdiest. As mentioned, the body and rotors are designed with high-quality carbon fiber, which makes it pretty durable. Unfortunately, there is a lack of metal elements and the main issue is with the folding arms. Each of these arms (six in total) is able to fold down for the better compactness and convenience. The collapsible modern design makes it quite easier to pack up/unpack and transport, but on the other side, the hinges that serve to fold down the arms are a bit vulnerable and not durable. The landing gear is specially designed to retract at the flick of a switch, which may be useful while recording. Besides, you can also retract out the landing gear, which allows you to enjoy 360° view of the surrounding. With a wingspan of 16.1 inches (410 mm), this drone is average in size when it comes to the commercial UAVs. Actually, its exact dimensions are 20.5” x 18” x 12.2” (520 x 457 x 310mm). When folded, the overall dimensions are 13.8” x 10.6” x 10” (350mm x 269mm x 254mm). 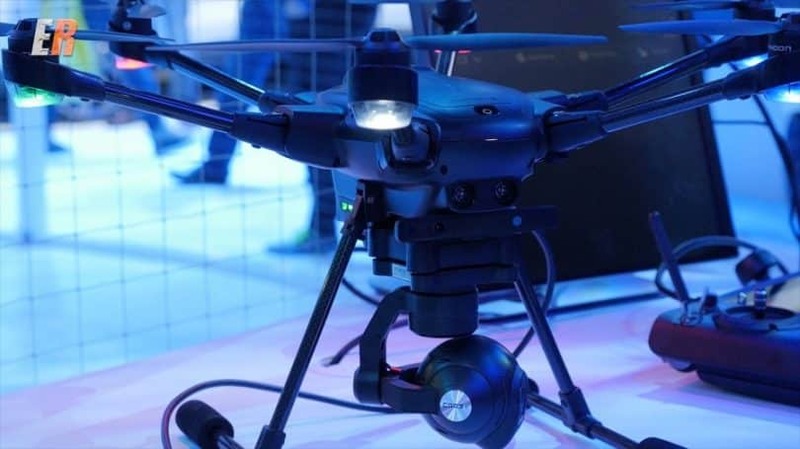 Yuneec Typhoon H480 is one of the heavier commercial hexacopters on the market, since it weighs 4.1 pounds (1,850 grams). As for the color, you can only buy it in black. Typhoon H480 is an advanced platform for both aerial videography and photography, as it comes with the powerful built-in CGO3+ 4K UHD camera. 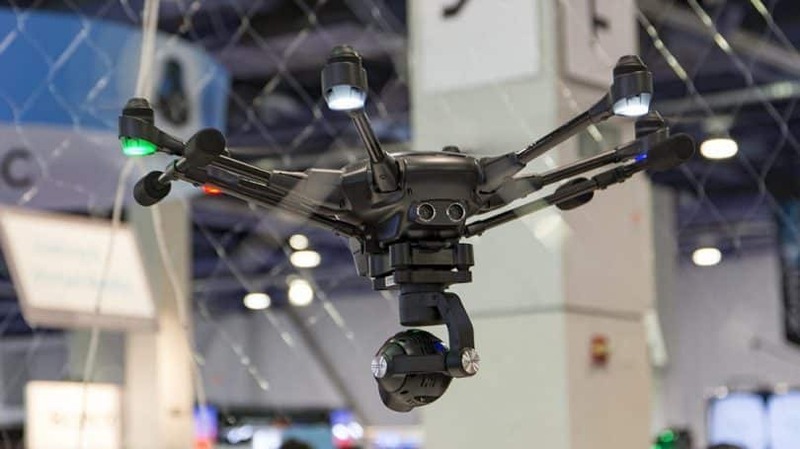 It features distortion-free lens, 30fps 1000MB high-quality video capturing (or 1080p at 120fps), as well as the live footage in 720p 12MP resolution along with an integrated digital video downlink that has a range of 1.6 km. In fact, this is an improved version of the CGO3 camera you can find on the Typhoon Q500 model (its predecessor). Also, in comparison with its predecessors in Typhoon series, this model has a faster processor, wider field of view, and bigger sensor as well. The camera itself is fascinating but the main highlight of this copter is its 3-axis anti-vibration gimbal. This 360-degree gimbal makes a drone ideal for the cinematic purposes, since it can capture ultra-stable 4K videos while in flight, and rotates the camera for 360 degrees. Also, it offers the possibility to set the camera while in the air. You will have a 98-degrees field of view while capturing videos thanks to the wide-angle lens, which is another great advantage of this model. As far as the power supply, the drone in question requires a 4s 14.8v, 5400mAh LiPo battery to work. With a fully charged battery, this aircraft can fly up to 25 minutes, if you fly it in optimal conditions. However, according to the customer reviews, it can stay in the air for about 23 minutes in the least-demanding conditions, and nearly 20min when flying it a bit harder. So, you will have to check out yourself. To charge the above-mentioned battery, you will need a Sc4000-4 charger. The charging time is slightly more than 2 hours, which is a lot of time! Therefore, if you want to fly this drone for a longer time, or if you plan to do a substantial amount of filming, you should carry a couple spare batteries with you. Keep this in mind! As for flight range, the Typhoon H480 will fly almost a mile away from the controller before losing connectivity and it will stay fully functional until it reaches around 4,000 feet in height. 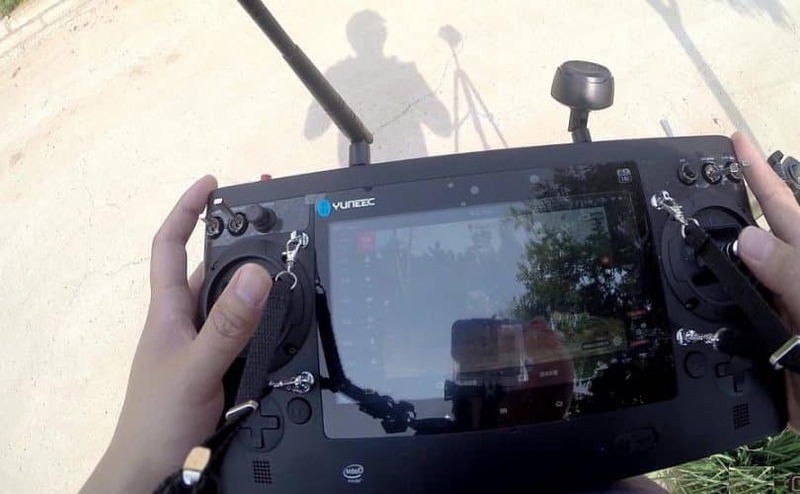 Controlling Yuneec Typhoon H480 is quite easy for the seasoned professionals, but if you are a beginner UAV pilot, you’ll have to put much effort to master the controls around the ST16 ground station. Actually, this model is not recommended for newbie drone pilots at all. However, once you master all the control functions, it is a real pleasure to fly this hexacopter. You can perform different actions such as acceleration, ascent, and altitude, as well as to adjust the flight modes with the certain buttons under your thumb. 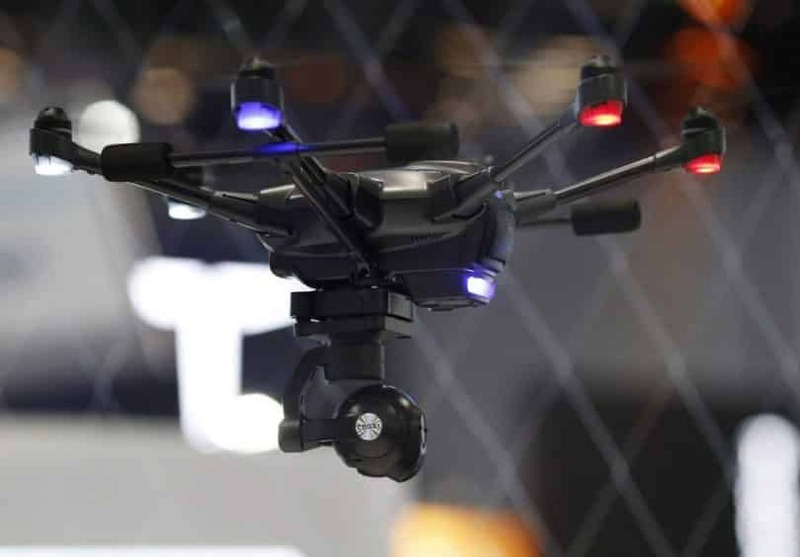 As well as the standard buttons and knobs, the controller has a 7-inch touch screen monitor, which streams live videos from the drone’s built-in camera and also displays telemetry data. On this large touchscreen, you can track the live recording of a flight and there is no need for any external device. Its ground station consists of an integrated transmitter, an Android platform, and receiver. It allows you to set up the autonomous flight according to your needs and capture the stunning aerial photos and videos. All the controls are divided into two main flight modes – Angle and Smart mode. The first one includes the basic aircraft controls. 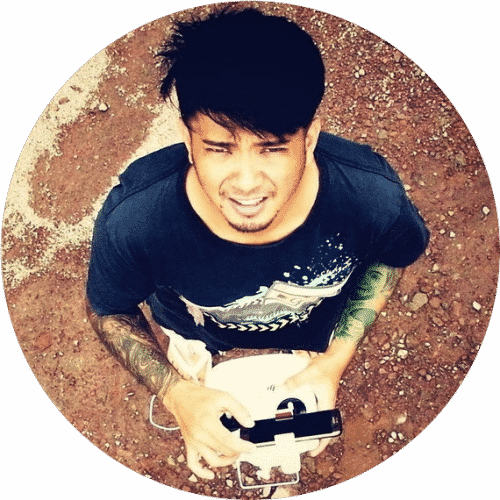 Moving the right joystick, you control the direction of drone movement in the air. The Smart mode is actually a simplified control scheme which allows even the least experienced pilots to fly this advanced copter. This alternative mode also enables a range of autonomous piloting functions, so you can perform various maneuvers with ease. What’s more, you can link the drone to two controllers at the same time, which gives you the flexibility to control the drone with one controller and control the camera with the second controller. Additionally, a Wizard Remote control (a compact scaled down version of the standard controller) allows you to fly the drone with just one hand. 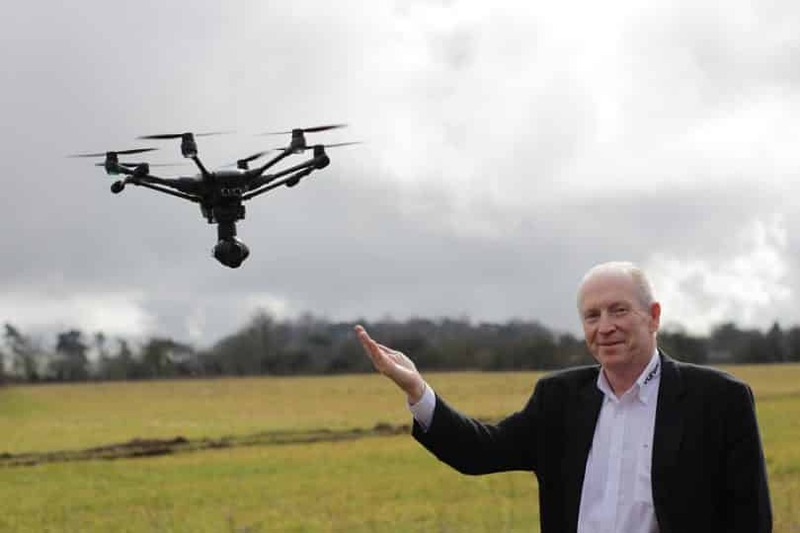 This clever technology means that instead of using your two thumbs to navigate the controls, you can point the controller in any direction and the drone will fly that way. Orbit Me – It flies circularly around you while focusing the camera pointed at you all the time. Point of Interest – Autonomously hover around a certain subject you selected, so-called ‘point of interest’. Journey Mode – The drone fly up to 150ft away from its pilot, and it is primarily intended those who want to capture the aerial selfie images. Curve Cable Cam – Allows you to set up a circular trajectory for the drone to fly. You need to enter the coordinates while controlling the camera position and these ‘waypoints’ will determine the curve flight path of your drone. Follow Me / Watch Me – When using this mode, the drone will move along with its pilot, wherever he/she goes. If you are biking or skiing, for example, you do not have to move around the ground station because the drone will move around you. It will follow the remote leaving your hands free. At the same time, it enables the camera to get pointed at you all the time. Dynamic Return to Home – It returns the drone at the starting point of the flight. The drone will land within 8m of the pilot. Team Mode – With this amazing mode, you can connect one Ground Station to the camera and another one to the drone simultaneously. This will significantly improve the cooperation between a camera operator and pilot during the more demanding operations. In addition to these great flight modes, Typhoon H480 also features collision-avoidance system and 5-rotor Fail Safe Mode, which ensure safety in the air, reducing the risk of being damaged. There are several sonar sensors on the front side, which allow the copter to stop automatically when it gets too close to the surrounding objects, which ensures a safer flight. In addition, its six-rotor system switches to the 5-rotor mode, which enables the aircraft to stay in the air, making flying very safe. This is a fairly expensive model, so you will have to spend from 1300 to 1800 dollars on this product if you buy it today. Typhoon H480 is driven by customer demand and it manages to deliver top-notch capabilities. However, this makes it quite difficult to reach when you’re just a regular Joe. We can only hope that the manufacturer will slightly reduce the price in the near future and make it more affordable for the customers. When it comes to the guarantee, there’s no mention about this useful info on the official Yuneec website, so you will have to contact them (or your supplier) in the case your item was delivered damaged or incomplete. The guarantee period mostly depends on what provider you are using for shopping. There are a lot of great features in this new Typhoon model. While some of them are just improvements with regards to the previous models, some features are brand new. As you can see, both the features and specifications on this remarkable copter are really outstanding. Another thing worth mentioning is about its rotors’ redundancy. H480 contains six rotors instead of four, which is a most common case on today’s commercial drones, but it can fly with five rotors. 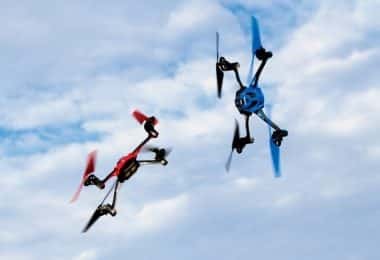 This means that, if you lose or get one rotor damaged, the drone will immediately recognize the problem and activate back to the home flight mode for the necessary repairs. One of the most similar models to the Typhoon H480 you can find on the market is the 3D Solo. However, this is a quadcopter which means it’s missing two arms to resemble the H480. Still, the 3D Solo is considered due to its advanced technology, which makes it one of the most intelligent drones in the market. 3D Solo is the only commercial quad on the market today that works through two Cortex-A9 Linux computers – one on the drone, and another one integrated into the controller. Its game-style controller contains a lot of pushbutton commands, which allows you to easily put both drone and camera at your fingertips. What’s more, there is a wide variety of flight modes, including the Orbit, Follow Me, Cable Cam, and Selfie mode. As I’m sure you already noticed, these modes are also included in the Typhoon H480. You can attach a GoPro 4K camera to this quadcopter, so it can make the smoothest aerial photos and videos. The 3-axis gimbal enables this drone to automatically capture ultra-stable shots. Also, this advanced gimbal offers in-flight GoPro controls, streaming the wireless videos from the camera directly to an Android mobile device. 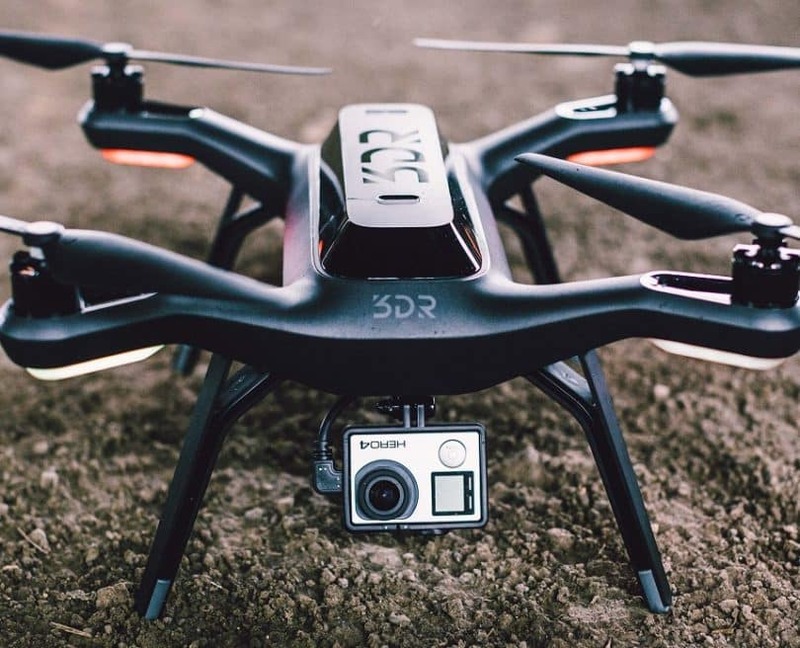 For a much better insight on this model, we suggest that you also read our 3DR Solo in-depth review. The size is 16.4 x 16.5 x 9.2 inches, and it weighs 11.7 pounds. To work, this drone requires a 5,200 mAh Lithium Metal battery, which gives about 25 minutes of flight. It takes nearly 100 minutes to recharge the battery. In terms of the design, this model is very similar to H480. However, the functions and features are quite different. It is also a hexacopter by its structure, but there is no controller. It only provides a set of basic flight controls which are built into the smartphone app with 12 different camera movements in total. The main advantage of this model is its auto-follow technology, which allows the drone to slide in or out, hover close or far, follow the pilot from a fixed position, and much more. Hexo+ does not contain a camera in its composition, but there is a decent 3-axis gimbal to attach the camera, such as GoPro Hero 4. 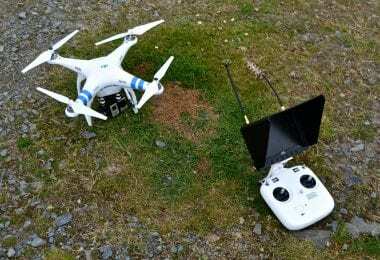 Therefore, it is often used for aerial photography and videography. With a fully charged battery, this hexacopter can stay from 15 to 18 minutes in the air (a bit less than the Typhoon hexacopter in question). It takes about 90 minutes to charge the battery and the control distance is up to 300 feet, according to the manufacturer. Finally, let us compare it with one of the models produced by the mother company. The Q500 is surely one of the most famous quadcopters when it comes to the Yuneec drones. This quad features a 3-axis gimbal camera, different flight modes, steady grip, a personal ground station with the ST-10+ 5.5″ Android touchscreen (similar to the Typhoon H480), 3-Cell 5400mAh / 3S 11.1V LiPo battery, and Lexar 64GB Card Bundle. Thanks to the great camera gimbal, you can take 16 MP photos and HD 60 FPS videos while flying it. With the CGO APP, you can transfer the photos/videos on your smartphone or any Android device. To get more familiar with all the features and characteristics of this model, we suggest checking out our Yuneec Typhoon Q500 in-depth review. As for the flight range, it is almost the same as in H480. It requires 5400mAh 3-Cell or 3S 11.1V LiPo battery to fly, which is designed as a cartridge. Although this model is much weaker than the Typhoon H480 regarding the features, it is more appealing to customers due to the significantly lower price – approximately half (about $750). If you interested you can check its price on Amazon. The hinges for the folding arms can be damaged or get flimsy after a while. 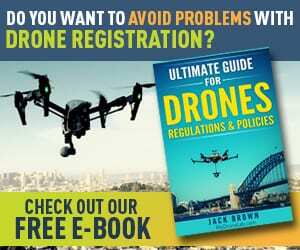 In the end, our recommendation is to read the specifications carefully and check in with the provider, to make sure you get the drone you need. Today you learned about the main features sported by the Typhoon H480. I don’t really know what you think about it, but in our opinion this drone rocks! It is a gorgeous hexacopter that promotes power, amazing technology and fantastic features. What more could you want? Oh yes, a smaller price. If you decide to purchase this gorgeous copter, we’re waiting you back here to tell us you experience. Did the drone managed to reach your expectations? Are you happy with it?